This is the second of several installments concerning the contribution and origin of numerous breeds of cattle and their purposes for man. The planet earth is full of great plants, animals and even people. These three consistently reproduce like-kind until natural disasters, drought, famines and deadly weather conditions force certain genetics to multiply and others to be eliminated. Left out of man's control, things change very little for hundreds of years. Food animals and plants of special taste-value to man have been selectively mated and rapid changes have been controlled and accelerated. Such is transportation of cattle. As each nation or population area began to multiply three or four thousand years ago the handling of cattle, and genetic improvement was rewarded with profit for those who used the best science of their day as tools. To this day more cattle are moved by people on foot than any other way. From the origin, small herds were handled and moved by their owners or family members. Unlike Hollywood's flamboyant films of multiple cattle stampedes, most cattle were in small herds raised under very gentle conditions. The fake Hollywood stampedes of Texas Longhorn cattle are imitated today by their cousin the fake Hollywood car chases which is scripted to be the adrenaline rush grand film-finale. In real life there is probably only one real O. J. type car chase for every 50 filmed chases. The stampedes were probably about the same ratio. In the USA there are just over 900,000 cattle producers. According to the last census, 498,000 owners care for less than 20 cattle. So, not a lot different from 4000 years ago, most cattle owners have small herds. The national geographic coverage may show graphics of thousands of animals driven per herd, yet history is full of small groups handled carefully by a few family members. Wherever you live it is easy to erroneously assume the rest of the world is similar to your area. If you live in the USA aluminum goose neck trailers are abundant where cattle are being moved. Large semis that hold over 50 adult cows roll down the roads with all the weight the law allows. However not many years ago there were no aluminum trailers in Europe and many countries have none to this day. 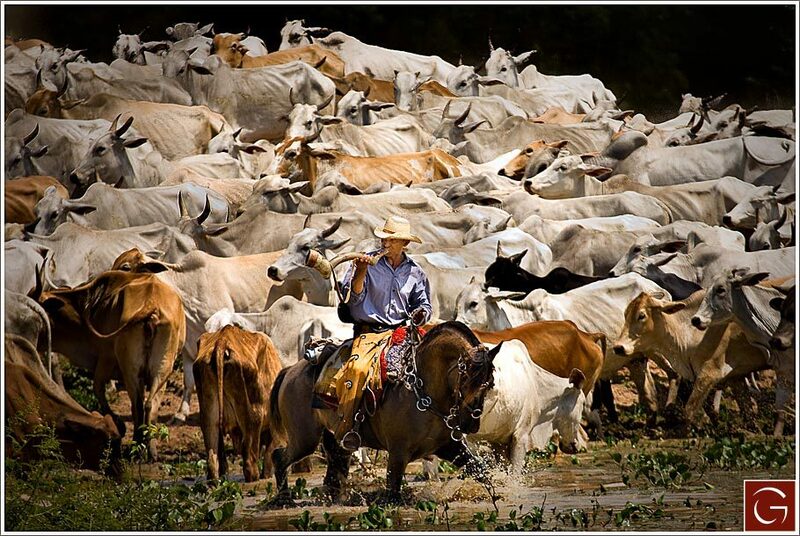 Cattle are moved by foot or driven horseback to market. The word "cow puncher" originated in Europe where groups of cattle were moved by foot down narrow roads. Each drag-puncher had some form of sharpened stick, pole or rod to punch the slow moving animals to keep the herd moving. In Bible days the Lord Jesus told the apostle Paul in Acts 9:5 "It is hard for thee to kick against the goads." As many Bible illustrations involved livestock examples, this was an understandable picture for Paul that if he fought against the Lord, it was like an ox who was punched with a sharp instrument to make them go, and then the ox kicks the sharp point to do further damage to themselves. Cow punchers come in all shapes, ages, sizes and garments. Most dress to do the job. If the area is brushy and cactus is abundant, chaps, boots and other protective trappings are important. In the American West the garb is often well past normal necessities as many buckaroos wear flamboyant decor well beyond any practical use. 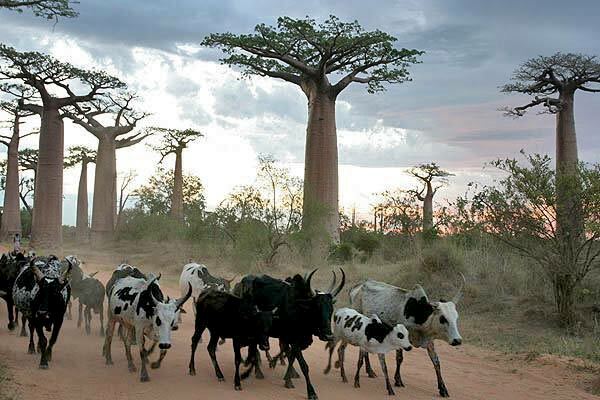 In Africa where heat is the main enemy rather than rattle snakes and cactus, the garb may be a one size for all loose-fitting cow punchers dress and walk bare-footed. Generally the clothing fits the job, the climate and the need of the business. Western books and movies make a wild colorful image of cattle handling. Yet, in a large part of the world no cow-puncher has any access to these USA entertainments. A cow may produce milk, pull loads, or provide a food service; often a family owns only one cow. Very few cattle producers around the earth own a horse to handle their few cows. Cattle are handled by foot with a goad -- millions of them. The earth is 4/5ths water. 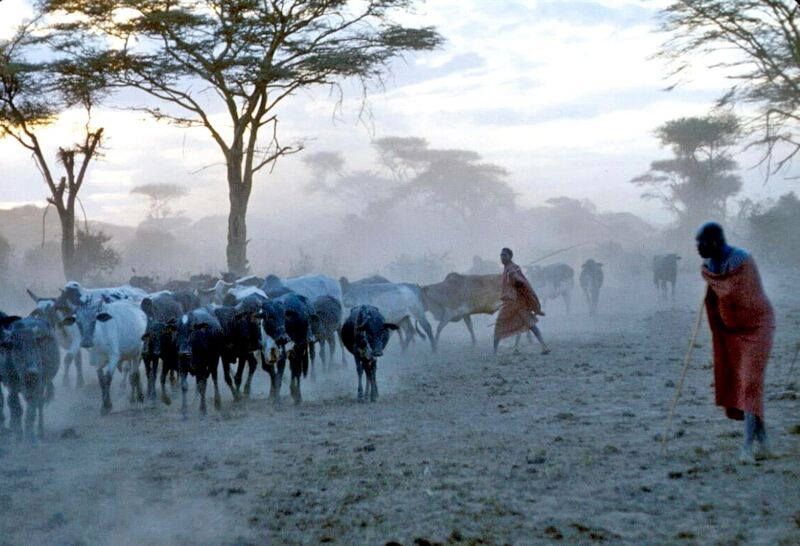 As a result more cattle are raised in tropical wet areas than dry desert countries. 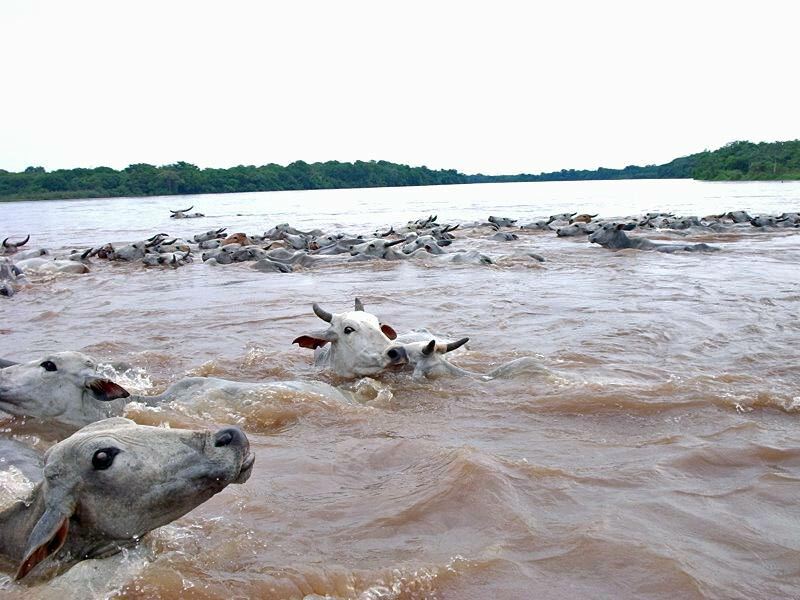 Cattle are trained to trail into, through and across flowing river currents. The cattle of the world are mostly grass or browse eaters consuming totally non human foliage, a high percent in very wet areas. Cattle breeds that do well in tropical hot and or wet areas dominate the bovine industry. Cattle who produce without a single hand full of grain or human provided feed are normal, world-wide. 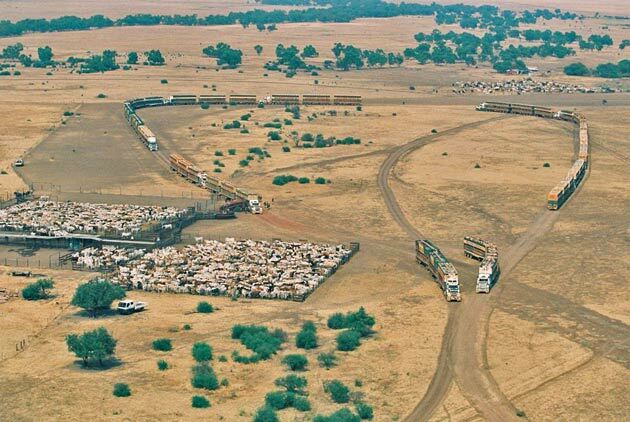 This photo shows the awesomeness of the massive Australian cattle stations. To live in this desert environment and produce healthy lean beef is an achievement only certain breeds of cattle can do. Much of the earth was not suitable for livestock production until hand-clearing was done. Irrigation systems transported water in the deserts to grow forage. In the Netherlands dikes were build to restrain the sea water. In Ohio, our state, it is said that when the first settlers entered the state it was solid forest, "A squirrel could cross Ohio and never have to touch the soil." As more demand for red meat protein was needed livestock managers cleared low value tree/brush and planted higher producing grasses to better feed the population. Cattle of the earth have provided the major amount of protein for humanity, and always will. The largest of the large ranches find some applications where movement with helicopters is the most efficient. 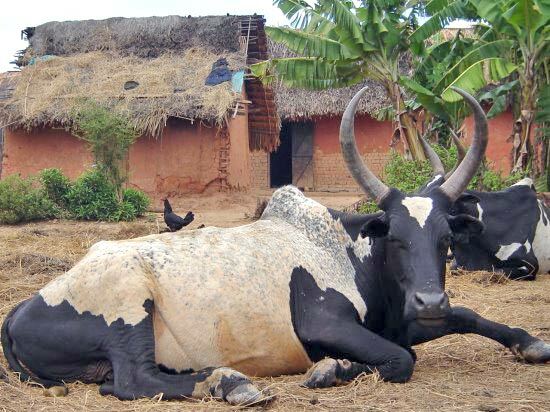 This is a far cry from the one family cow management of Africa. Horses are used in the larger herds and can cover fairly rough ground. 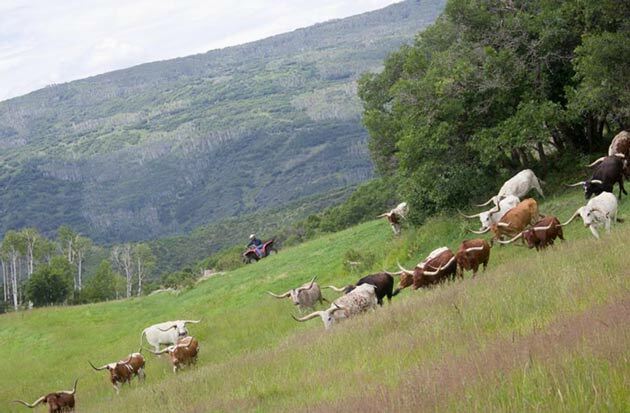 The use of horses and riders became world famous with the trail drives of Texas Longhorn cattle during the late 1800s. The word "cowboy" became a symbol of the young men who pointed the herds north from Texas. Many of the riders were teenagers. The job was not one for senior citizens as presented on the silver screen. Prior to Texas trail drives, most world herds were smaller and confined to private property. On the really large ranches of the USA and Australia the endurance of horses requires super stamina. The raising of cattle is not without hard work and some rugged handlers. 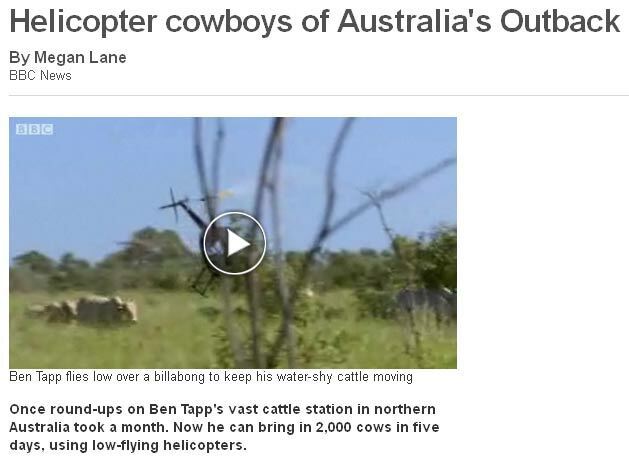 Some of the largest ranches in the world are in Australia. The wonderful thing about cattle is that they will walk dozens of miles pre day to water and fiber, care for themselves for years at a time, consistently having a calf ever year and require little or no human care or feeding. This is a miracle in the red meat industry and of proven merit for thousands of years. Cattle will profit humanity by ranging unassisted for their existence unlike other meat producing fowl, pork, goats, sheep, etc. The magic of transforming, by God-given metabolism, raw plants into nutritious steaks and high test omega 3 foods is the joy of being in the cattle business. As cattle handling, hauling and movements continue to grow more high-tech, small ATV's are taking over farms and ranches around the world. No question it appears unusual to see a cowboy riding a motor cycle across the prairie to check the wind mills or put out minerals for stock, but it is a changing world. Here in Ohio we use Hondas -- they will go 40 to 60 miles a day without tiring, run over rocks, ground hog holes, and never breaking a leg. These little 4 X 4s get about 40 miles per gallon, can be equipped to carry weapons, fence repair supplies, vaccines, they have lights, and will maneuver over mud, snow and some serious steep hills and ditches. They can be used to sew seed, pull mowers, small trailers and carry special feeds to needy stock. Their top speed is about 35 miles per hour. It may not be what people around the world think is "cowboy-western," but it is efficient, safe and the best for many jobs at this time.